The wedding of Benjamin J. Grimm and Alicia Masters. After literally decades of a relationship, The Thing finally ties the knot with the love of his life, Alicia. No Skrulls. No super heroes. No super hero shenanigans. The issue has a distinct special feel to it as there are three sections by different artists, all written by Dan Slott. The oversized issue would represent the 650th issue of Fantastic Four, if we counted things like Marvel does. This was a really fun issue with a ton of reminders of who these characters are and why we loved them for so many years. We get Mr. Fantastic focused on a project, ignoring everything else. Susan being the strong center of the Four that she is. Johnny Storm feeling some anxiety about his own lack of successful relationships. Franklin feeling his teenage angst by changing his hair color. Spider-man wanting t come to the wedding and give a speech. 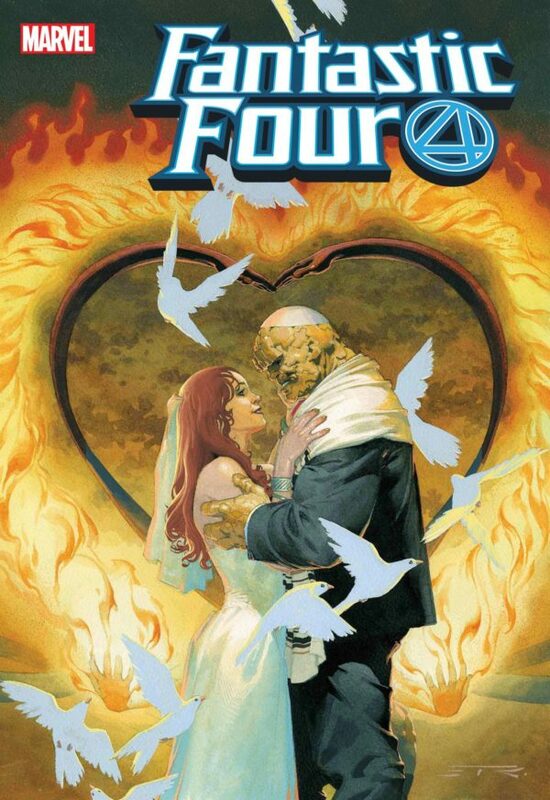 Fantastic Four#5 is a great trip down memory lane and gives us a wedding long overdue. Congrats to Ben and Alicia.